It's the first Mask Monday of 2016! To celebrate, I am going to be sharing 2 mask reviews! 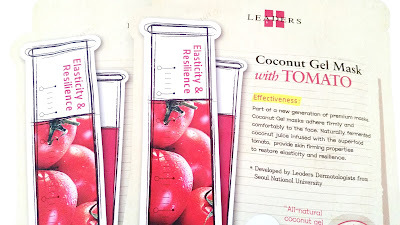 The first one is obviously these Leaders Insolution Coconut Gel Mask with Tomato and the second one will be Innisfree's Capsule Recipe Pack Rice Sleeping Packs. Leaders masks have been well liked by many in the beauty community for a while now. So, I decided to get some myself to see what the hype is all about. I purchased the Leaders Mask Value Set from Memebox so I can try a variety of Leaders' masks. 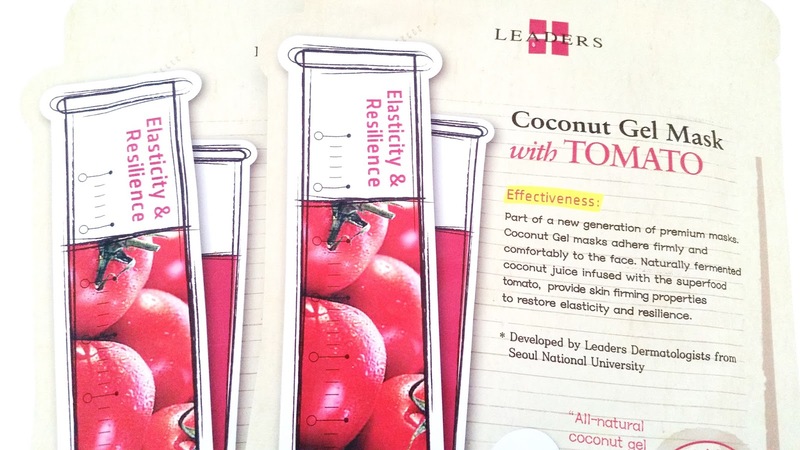 Leaders is known for their Coconut Gel masks, which are made from all natural fermented coconut juice. The Insolution masks were actually their first line of masks. The name 'Insolution' came from the idea of helping skin heal from the inside out. Insolution masks are designed to care for under-skin problems by using special formulas that uses natural ingredients. 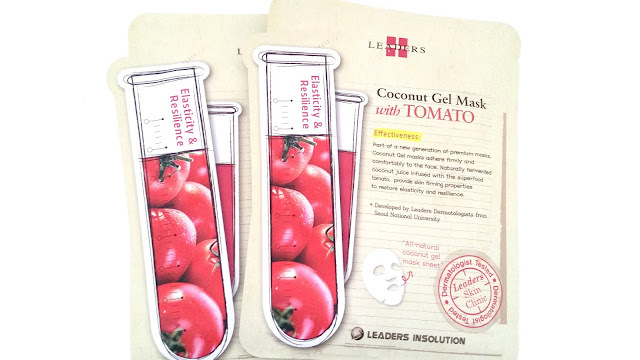 Product Description: A natural coconut gel mask formulated with tomato extract to keep the skin youthful by restoring its elasticity and resilience. Tomato extract contains Lycopene, which is a powerful antioxidant that can help to strengthen the skin and add resilience to the skin. This mask can also help to soothe and hydrate the skin while nourishing it. The mask is great for those whose skin is beginning to show signs of aging, who has dull skin, or those with elasticity decline. To Use: Cleanse the face first. Remove the mask from its protective packaging and apply it onto the face. Make sure the eye/lip/nose areas are aligned. For best results, leave the mask on for 20 to 25 minutes before removing. Gently massage any excess serum until it is fully absorbed. Ingredients: Water, butylene glycol, acer saccharum (sugar maple) extract, betaline hydroxyethyl acrylate/sodium acryloyldimethyl taurate copolymer, glycerin, xanthan gum, portulaca oleracea extract, chamomilla recutita (matricaria) flower extract, arnica montana flower extract, artemisia absinthium extract, achillea millefolium extract, gentiana lutea root extract, ledum palustre extract, ecklonia cava extract, artemisia capillaris flower extract, houttuynia cordata extract, saururus chinensis extract, lactobacillus, leuconostoc, cocos nucifera (coconut) fruit extract, solanum lycopersicum (tomato) fruit extract, caprylyl glycol, ethylhexylglycrin, 1,2-hexanediol, fragrance. 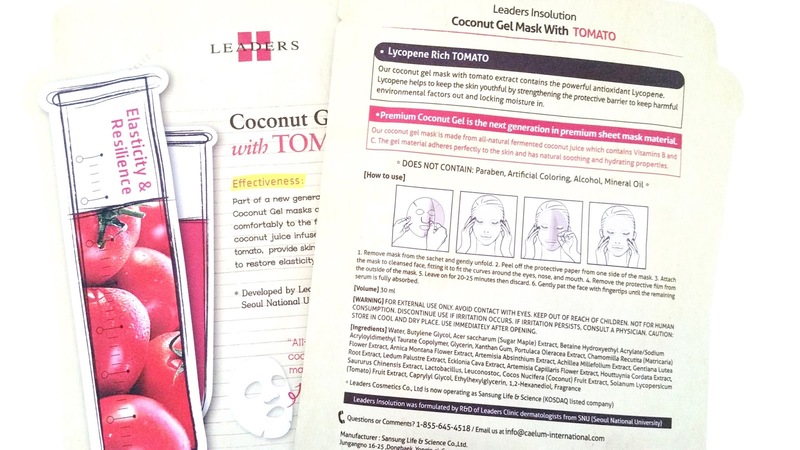 Packaging: Leaders mask packaging comes with a lot of information and it is all in English! So no need to worry about translating. The front of this mask comes with the name of the mask, image of the superfood ingredient, its effectiveness, and other information. 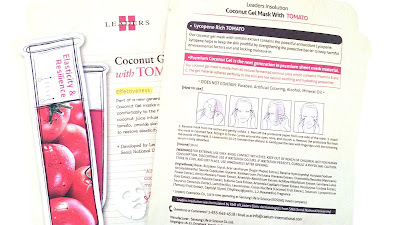 The backside of the mask comes with more detailed information, which includes instructions and ingredients. 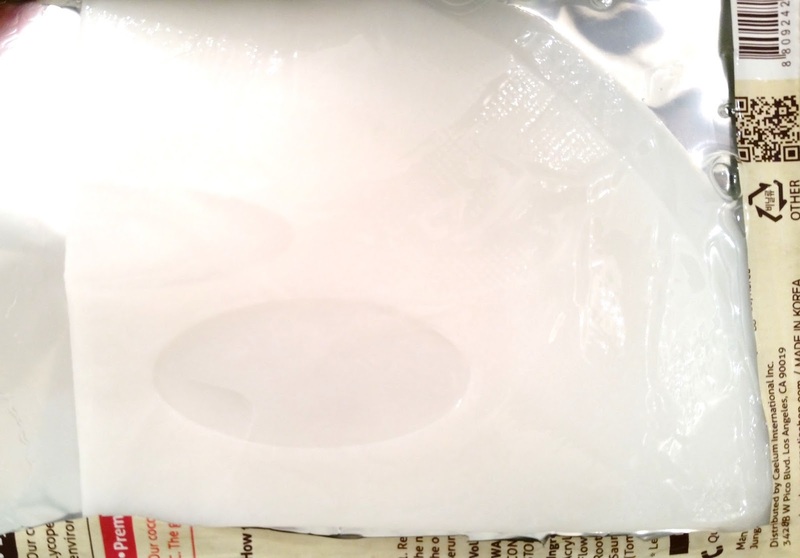 The coconut gel mask on the inside is protected by 2 layers of paper films. Scent: Fragrance was added to the mask which probably explains its muddied scent. I'm not a fan of the scent. It smells like coconut water gone bad so strong floral fragrances were added to cover the scent, but it just became muddied together. It is really strong when you first open the pouch and apply the mask on. However, over time, the scent lessens. The scent is probably my biggest dislike about this mask. Color: The mask is a bit milky and it's also a bit opaque. It looks almost see through but not quite. 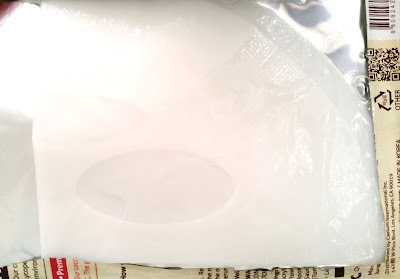 Texture: The coconut gel mask doesn't quite feel like hydrogel masks. It's softer and a bit thinner and doesn't have the mesh that most hydrogel masks have. It feels a bit flimsy at first but sticks on really well like saran wrap. The serum for the mask feels thick and a bit slimy but it dries nicely and doesn't feel sticky. My Thoughts: My mom and I both tried this mask and we both agree that the scent isn't something we are a fan of. However, we powered through it because it didn't cause either of us any irritations. The instructions claims that best results are obtained when the mask is left on the face for 20 to 25 minutes. However, we weren't able to make it to the 20 minutes mark because the gel mask dried before that. For me, the mask was dry at the 15 minutes mark. The forehead, nose, and chin sections were completely dry to the point I had to peel it off like a peel off mask. (It was not fun.) The cheek areas were still nice though but I had to take the mask off. I forewarned my mom who applied her mask 5 minutes after I did, so she didn't have to worry about the peel-off issue much. She ended up taking her mask off after 12 minutes because her forehead area was already getting super dry. We are disappointed that the mask doesn't last as long as it claims. As for its effects, well, some were effective, some weren't, and there were also a few surprises. The mask did hydrate our skin and left it feeling nice and moisturized. Since I have sensitive skin, the first couple of minutes after mask application wasn't really soothing. I was worried that it would cause irritations due to the strong fragrance and also because it was feeling a bit warming. However, after about 2 or 3 minutes that feeling went away and while the mask felt a bit cooling after it wasn't really super soothing. My mom doesn't have sensitive skin and she felt the mask was a bit soothing but not as much as other masks she's tried. Both of us felt our face seems a bit more plump after we removed the mask. Can't really say how much elasticity or resilience was restored for our skin but the mask did leave our skin feeling soft. This mask didn't provide much anti-aging care for my mom, which is a bit disappointing. On a plus side, this mask was able to brighten our skin a bit. I was personally pleased that it was able to lessen my redness a bit, which is nice. My mom and I also liked how well the mask sticked to our faces despite it's slightly awkward fit. For both of us, there's a lot of excess mask for the chin area. We ended up having to make multiple folds for it to fit. It is always good to note that masks comes in a one size fit all type of deal, so there will be masks that won't fit well. 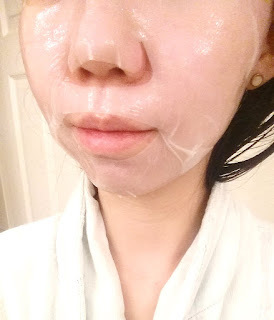 However, since this coconut gel mask sticks on well (think saran wrap well), the awkward fit didn't seem so bad. The only downside with this is that if you accidentally let the mask dry on your face, peeling it off can be a bit painful and annoying. Final Thoughts: I think I sort of understand why this mask is hyped so much. The mask sticks on the face nicely no matter the fit, so you can do whatever without worrying about it sliding off your face. Its effects are nice too. It was able to add suppleness, moisturize, nourish, brighten, soften, and lessen redness on our faces. We weren't fans of the scents of this mask and for those who are sensitive to scents, it might be wise to give this a skip. We also didn't like that the mask dried way too fast. It doesn't even last its recommended time, which is disappointing. 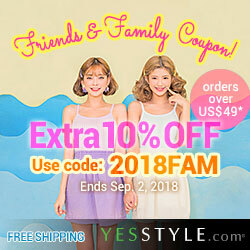 Would I repurchase this product again in the future? Probably not. The scent is the big turn off for both my mom and I. No need to subject ourselves to masks with scents that we don't like. While the mask does have some good effects, it also missed some as well. It is also unfortunate that the mask dries too fast and doesn't even meet its recommended time. Do I think this is worth a try? Honestly, not really. The pros aren't worth the cons and there are a lot of other masks on the market to try.